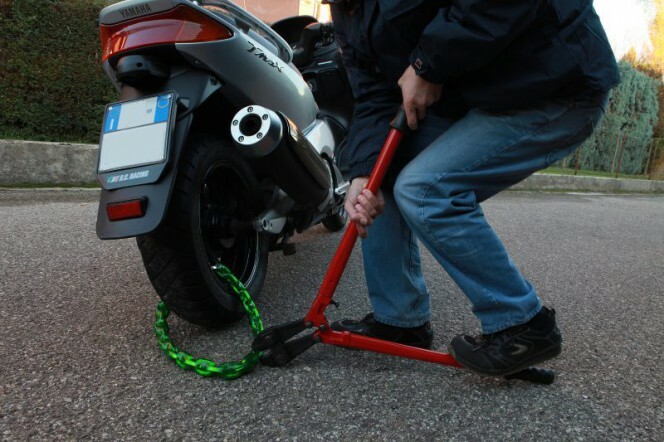 The main precaution to be taken when using twisted cable locks and chains to tie up bicycles and motorcycles is to position them so that they are kept off the ground. By doing so hinders attempts to cut with them with cutters and shears. If the cable or the chain touches the ground, it is possible to rest the head and an arm of the cutters on the ground, thereby loading the entire weight and force on the other arm of the tool. This takes advantage of the leverage effect, and imparts a much higher force than could be developed by simply squeezing together the arms of the tool with both hands.The effect is clearly visible in this video, where various chains, even strengthened ones, are cut with relative ease. It may be seen in the video how the operators rest one arm of the cutter on the ground and apply all the force on the other arm, literally bouncing on it with their entire body. Just try to imagine the difficulty of achieving the same pressure if one had to keep the cutter raised and was forced to tighten it with 2 hands! The video also shows the help provided by the anti-slip mat, which prevents the arm resting on the ground from moving. The second suggestion is to use the cable or chain to tie together various parts of the vehicle , typically a wheel and the frame. Especially if you are securing a bicycle, it is absolutely essential to avoid tying up just one wheel, especially only the front one, because in this case it is very easy to remove the rest of the bicycle and take it away, especially if the wheels are equipped with a quick release mechanism. In this case, a good idea is to release the front wheel and tie it together with the rear wheel and the frame with a single chain or cable. Lastly, the motorcycle, moped or bicycle should ideally be always tied to a fixed point (pole, wall-mounted eyelet, etc.). This makes it impossible to remove the bike without attacking the anti-theft device. Otherwise, it could be stolen without even touching the padlock or chain, simply by loading it onto a truck. But be careful to check that the selected point is securely fixed; posts are commonly found in towns which move and can be pulled out with relative ease. If you are tying up a bicycle, take care also not to fasten it to a pole from which the chain can be removed from the top of the pole, simply by lifting it up together with the entire bicycle. Never rely on the presence of a sign at the top of the pole, as it might be easily removed by unscrewing just a single bolt. Also be aware of poles with litter bins, because these are also easily removed. The security level rises dramatically if 2 different systems are used to tie up the motorcycle or bicycle: a U-lock and a chain lock, a disk lock and a chain, a twisted cable and a U-lock, etc. Different systems require different skills and tools to be forced and combining more than one means that the number of potential thieves who are able to deal with both of them is decreased significantly. This entry was posted in Motorbikes and Bicycles and tagged tips on 23 May 2013 by Mara Rossi.